Police in Florida’s Escambia County say a woman and her adult sons who were murdered on July 28 were the victims of a “ritualistic killing” tied to the blue moon. Voncile Smith, 77, was killed in her home, along with her sons, 49-year-old Richard Smith and 47-year-old John Smith. Investigators also say they’ve identified a person of interest, but have yet to explain what about the murders might have been “ritualistic” in nature. “Initial research had led us to believe it was a ritualistic killing,” Morgan said Tuesday. All three victims were struck multiple times with a claw hammer and had their throats slit, and Richard Smith also had a gunshot to his right ear, Morgan said. In a news conference Tuesday afternoon, Morgan said investigators have interviewed a person of interest in the case who is known to practice what the sheriff described as “witchcraft.” The positioning of the victims’ bodies, Morgan said, led investigators to believe the murders were part of a ritual. “It’s witchcraft, I’ll say that right now,” is Morgan’s exact quote, which you can see in this video of his remarks. PNJ’s Will Isern also reports that the sheriff described the suspect as a white male, that there were no signs of forced entry at the home and a safe with money in it was untouched. Smith and her sons were described as “very reclusive,” with none of the neighbors having ever entered their home or met the family. There’s very little reliable data on the prevalence of ritualistic killings in the United States, but all the best indicators are that it is...uncommon. The FBI says that according to data from 2009, around 25 percent of homicide victims are slain by family members, and 58 percent by people they know. Sheriff Morgan’s last big bout of national publicity came in 2013, when he defended two of his deputies who shot 15 rounds at an unarmed 60-year-old man in his own driveway. 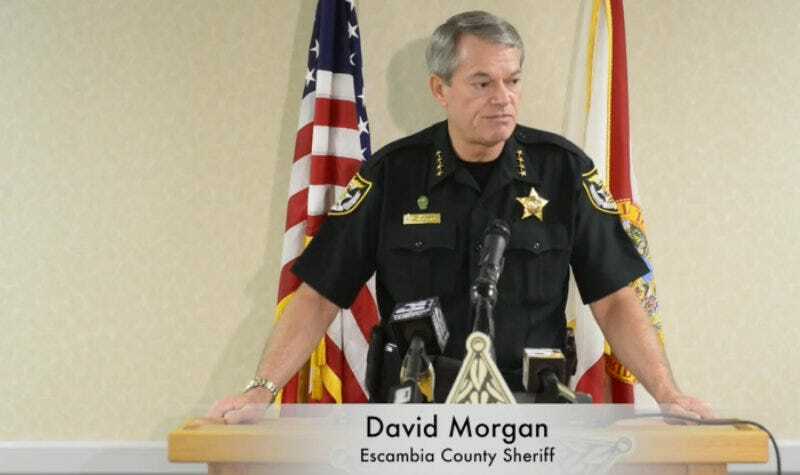 Morgan called the incident an example of “noncompliance to the directions of law enforcement officers,” and said that Roy Middleton, the man his deputies shot, was “both a suspect and a victim.” He followed that up with a disastrously weird and deeply racist video about the issues with “thug culture” in Escambia’s black community. He also argued much of the racism African-Americans think they see in the United States is “perceived” and not real. Unlike ritualistic Wiccan killings, which are totally real.